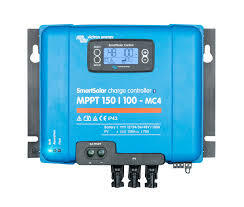 Ultra-fast Maximum Power Point Tracking (MPPT) Especially in case of a clouded sky; when light intensity is changing continuously; an ultra-fast MPPT controller will improve energy harvest by up to 30% compared to PWM charge controllers and by up to 10% compared to slower MPPT controllers. Advanced Maximum Power Point Detection in case of partial shading conditions If partial shading occurs; two or more maximum power points may be present on the power-voltage curve. Conventional MPPTs tend to lock to a local MPP; which may not be the optimum MPP. The innovative BlueSolar algorithm will always maximize energy harvest by locking to the optimum MPP. Outstanding conversion efficiency No cooling fan. Maximum efficiency exceeds 98%. Full output current up to 40?C (104?F). Flexible charge algorithm Fully programmable charge algorithm (see the software page on our website); and eight preprogrammed algorithms; selectable with a rotary switch (see manual for details). Extensive electronic protection Over-temperature protection and power derating when temperature is high. PV short circuit and PV reverse polarity protection. PV reverse current protection.